The Official Round Notary Rubber Stamp is not only great for any notary's budget but also for their tool box. It is the most traditional version out of all of our notary public supplies. Sometimes, basic is better. In the case of the Official Round Notary Rubber Stamp, all components of this traditional stamp is made in the United States. The handles, mounts and laser cut rubber die are all carefully handcrafted by our skillful team at Notary Supplies Online. With the use of an additional ink pad, you will receive beautiful impressions that are sure to impress even the most fickle client. Unsure if this is the correct product for your needs as a notary? Contact us! The Official Round Notary Rubber Stamp is an economical choice for your notary supplies. With the use of an additional ink pad, you will receive an unlimited amount of impressions - just be sure to keep your ink pad from drying out. 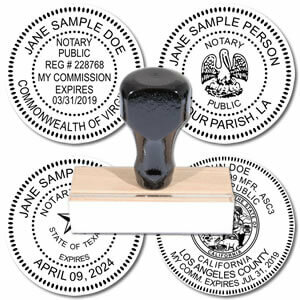 Each Official Round Notary Rubber stamp we create is guaranteed to meet all of your state's requirements. The approximate impression size of the seal on the Official Round Notary Rubber stamp is 1 5/8". The Official Round Notary Rubber stamp is permitted by most states.